Toyota City, Japan, December 18, 2017―Toyota Motor Corporation (Toyota) announces today its plans toward the popularization of electrified vehicles for the decade 2020-2030. Toyota's electrified vehicle strategy centers on a significant acceleration in the development and launch plans of hybrid electric vehicles (HEVs), plug-in hybrid electric vehicles (PHEVs), battery electric vehicles (BEVs), and fuel cell electric vehicles (FCEVs). Toyota has been working toward creating ever-better cars and an ever-better society under the thinking of contributing to a sustainable society and creating mobility that brings smiles to customers. Addressing environmental challenges, such as global warming, air pollution, and limited natural resources and energy supply are of utmost importance to Toyota. "Environment" is one of the anchors of the company's product development, alongside "safety/peace of mind" and "emotion." Electrified vehicles, which are effective for economical consumption of fuel and promoting usage of alternative fuels, are indispensable in helping to solve current environmental issues. In October 2015, Toyota launched the Toyota Environmental Challenge 2050, which aims to reduce the negative impact of manufacturing and driving vehicles as much as possible and contribute to realizing a sustainable society. In the ever-better cars category, Toyota aims to reduce global average new-vehicle CO2 emissions by 90 percent from 2010 levels. Today's announcement is the main pillar of a mid-to-long-term initiative to achieve this challenge. Toyota will accelerate the popularization of BEVs with more than 10 BEV models to be available worldwide by the early 2020s, starting in China, before entering other markets―the gradual introduction to Japan, India, United States and Europe is expected. The FCEV line-up will be expanded for both passenger and commercial vehicles in the 2020s. The HEV line-up will also grow, thanks to the further development of the Toyota Hybrid System II (featured in the current-generation Prius and other models); the introduction of a more powerful version in some models; and the development of simpler hybrid systems in select models, as appropriate, to meet various customer needs. Toyota also aims to expand its PHEV line-up in the 2020s. Batteries are a core technology of electrified vehicles and generally present limitations relating to energy density, weight/packaging, and cost. Toyota has been actively developing next-generation solid-state batteries and aims to commercialize the technology by the early 2020s. 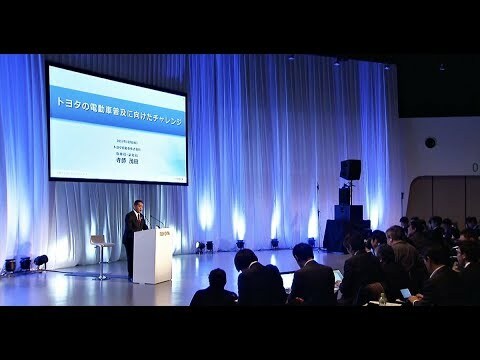 In addition, Toyota and Panasonic will start a feasibility study on a joint automotive prismatic battery business in order to achieve the best automotive prismatic battery in the industry and to ultimately contribute to the popularization of Toyota's and other automakers' electrified vehicles. Furthermore, Toyota aims to focus on the development of a social infrastructure conducive to the widespread adoption of electrified vehicles. This includes the creation of a system to help streamline battery reuse and recycling, as well as support of the promotion of plug-in vehicle charging stations and hydrogen refueling stations through active cooperation and collaboration with government authorities and partner companies. Toyota has been a leader in making vehicles while keeping the environment in mind. This is evident through the introduction of the iconic Prius 20 years ago, as well as the launch of the world's first PHEV, the Prius PHV, in 2012. The second-generation Prius PHV, introduced in 2017, further increased the vehicle's electric mode cruising range. Additionally, in 2014 Toyota launched the world's first mass-produced fuel cell sedan, the Mirai, which is being well-received by customers in Japan, the U.S., and Europe. 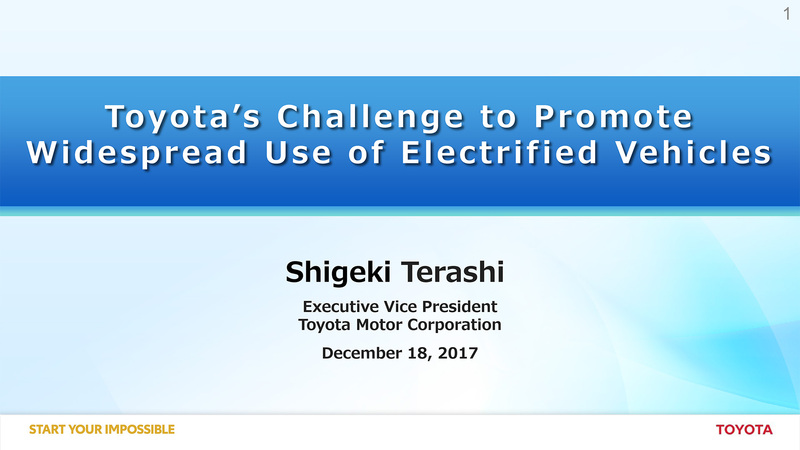 Through these activities, Toyota sales of electrified vehicles have reached more than 11 million units worldwide to date.